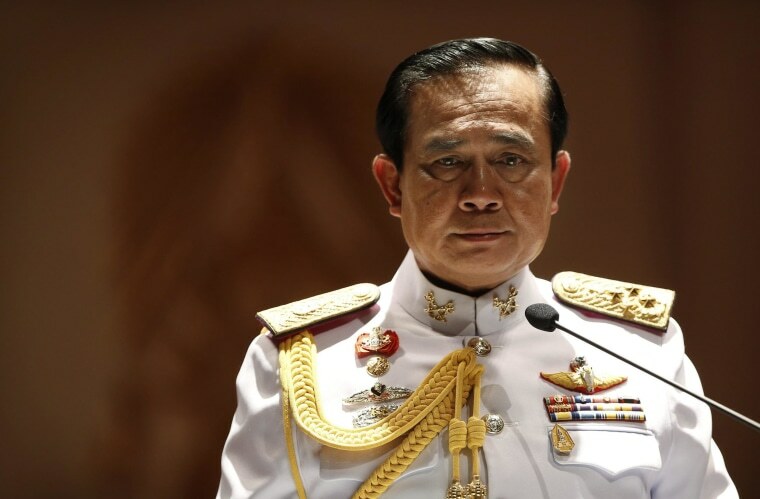 BANGKOK — Thailand's coup leader said Monday that the country's king had officially endorsed him to run the nation after the armed forces seized power last week. The announcement came one day after the junta warned protesters it was ready to crackdown on civilian opposition to its takeover. Dressed in a white military uniform, Gen. Prayuth Chan-ocha spoke at the start of his first press conference since Thursday's coup. He justified the putsch, saying that he had to act after a half-year of increasingly violent confrontations between the now-ousted government and its supporters, and demonstrators backed by powerful businessmen who had struggled to overthrow it. "The most important thing right now is to keep peace and order in the country," Prayuth said. "When the conflict intensified, and there was the threat of violence, we had to act." Suthep Thaugsuban, who had led seven months of protests and had been detained by the junta since the coup was announced last Thursday, left a military detention center Monday and later appeared at the attorney general's office escorted by police and soldiers. He faces insurrection charges for seizing government ministries and other infractions during his protest bid. The military has sought to limit the protests by detaining figures who might play leadership roles. The junta has defended the detentions of former Prime Minister Yingluck Shinawatra, most of the deposed government's Cabinet, and dozens of politicians and activists. It also has ordered dozens of outspoken activists, academics and journalists to report to military authorities. More than 200 — the majority considered opponents of the new regime — have been officially summoned so far in lists broadcast on radio and TV. The fate of Yingluck, who surrendered herself Friday, and many others remains unclear. Some detainees have been released, and the military has said it expects to free most after about a week.